OSAKA - Harumi Okuno pours another batch of octopus-filled batter into the round hollows of the hot griddle and looks out of the serving hatch toward the rugby stadium at the end of the street. “Even if people here didn’t play rugby when they were kids, once the rugby season starts at Hanazono they still go along to support the teams,” she says, turning back toward the two tables inside the tiny, cramped restaurant. “There are even supporters in their 90s who go along, and some who are 100 years old. Hanazono Rugby Stadium, in the eastern Osaka suburb of Higashiosaka, is hallowed ground for Japanese rugby. Built in 1929, it was the country’s first dedicated rugby stadium and has hosted the annual National High School Rugby Tournament every year since 1963. The original idea to build the stadium came from Prince Chichibu, who was traveling on a train to visit Kashihara Shrine in Nara Prefecture when he noticed the amount of vacant space along the line. He suggested to a railway company executive that a new ground for rugby, which was becoming popular at the time, might attract more passengers to the area. The stadium was modeled on England’s Twickenham Stadium, and featured a metal roof until it was removed to help Japan’s wartime effort in 1943. The ground was also used to train pilots during World War II, before it was occupied by Allied Forces in 1945. The roof of the main stand was reinstalled in 1992, and further major reconstruction work began in February last year to prepare the stadium to host games at the 2019 Rugby World Cup. The work was completed last month and the venue reopened last Friday night with a match between Japan and a World XV. “With its long history dating back to 1929, and as the home of Japanese high school rugby, Hanazono holds a special place in the hearts of all Japanese rugby fans,” says 2019 Rugby World Cup Organizing Committee President and CEO Akira Shimazu. Friday’s game was the first-ever night match to be played at Hanazono, thanks to floodlights which were installed as part of the upgrade. A giant high-definition screen has also been built into the north stand, new VIP and corporate hospitality areas have been added and concrete benches in the stands have been replaced with individual plastic seats. Facilities within the stadium have also been completely overhauled. A state-of-the-art hybrid turf pitch has been installed and a new exterior has been built along the main entrance, lighting up after dark to welcome fans. The stadium was completed at a total cost of ¥7.26 billion and now has a capacity of 26,542, which will be reduced to 24,000 by the time the World Cup kicks off on Sept. 20 next year. “It’s awesome,” says Toetu’u Taufa, a Tongan-born former Kintetsu Liners player who spent his entire 13-year career with the Hanazono-based club until he retired in March this year. “I like it because it’s closer to the fans. It’s world-class and it makes me proud. 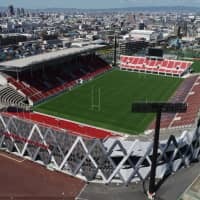 Hanazono will host four first-round matches at the World Cup — Italy vs. Namibia, Georgia vs. Fiji, Tonga vs. Argentina, and Tonga vs. the United States. As something of a local hero, Taufa is hoping the Osaka fans will support his native Tonga as their second team. The 38-year-old first came to Japan on a rugby scholarship at Nihon University in 2000 before joining Kintetsu four years later, and won 22 international caps for the Brave Blossoms, including one appearance at the 2011 World Cup. Taufa says his life in Japan has been made much easier by the help of others, including the 72-year-old Okuno and her husband, Hiroshi. 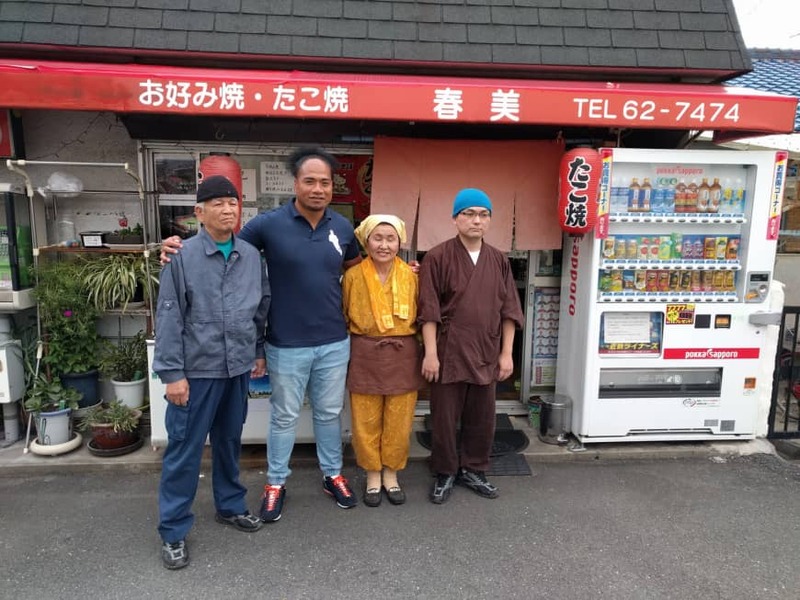 The couple, who have run a takoyaki (octopus dumpling) shop less than 100 meters from Hanazono Stadium for the past 35 years, describe Taufa as their “son,” and hope to extend a further welcome to supporters who arrive next year for the World Cup. Okuno is not the only Osaka native looking forward to welcoming the world to Hanazono. 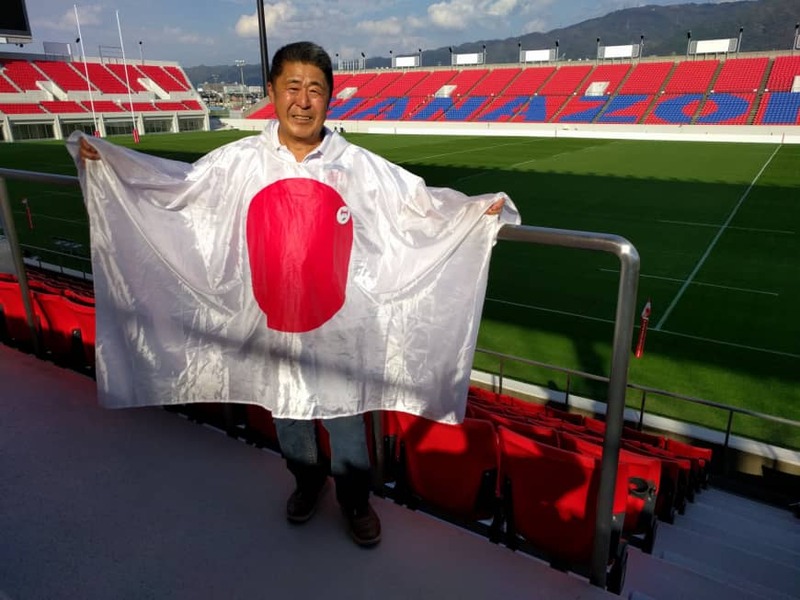 Daisuke Komura, who was born in the city but now manages a golf club in Mie Prefecture, has applied to volunteer at the stadium during the World Cup. Overseas rugby fans may not know Komura’s name, but they will almost certainly have seen his face. He was the supporter shown on TV crying with joy at the end of Japan’s historic 34-32 win over South Africa at the 2015 World Cup in England, a clip which has been replayed many times the world over. “The video of me crying at the end of the game is always shown everywhere, but the reality is that I started crying from the very beginning,” he says, draped in the same huge Japanese flag that he wore at the game in Brighton. 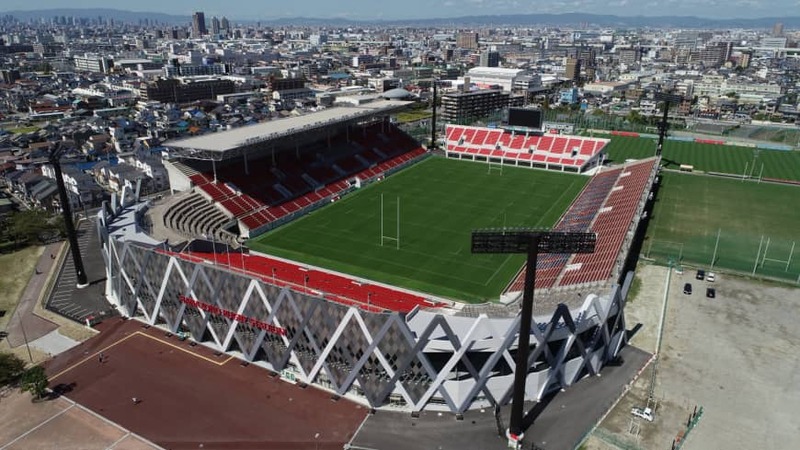 Komura believes the omission of Tokyo’s Prince Chichibu Memorial Rugby Ground — Japanese rugby’s other spiritual home — from the list of 2019 World Cup venues makes Hanazono’s inclusion all the more meaningful. Others, however, think Osaka has been given something of a raw deal. Hanazono will host only four first-round games at the World Cup, all of which are afternoon kickoffs. Kobe Misaki Stadium is the only other tournament venue in the Kansai region, and neither stadium will host any of Japan’s matches. “I wanted to see Japan play here at the World Cup,” says Takayuki Sakakura, an Osaka resident eating pizza with his 10-year-old daughter outside Hanazono before last Friday’s game. “The games that will be held here are afternoon kickoffs and I can’t go to see them. Osaka fans were at least treated to an exciting game to commemorate the reopening of the stadium, with a crowd of 16,846 turning out in unexpected rain to see a star-studded World XV survive a late fightback from Japan to win 31-28. Also watching was Yoshihiro Sakata, Japan’s only World Rugby Hall of Fame inductee and a former flying winger who called Hanazono Stadium his home during the 10 years he played for Kintetsu. As he stands in front of an exhibit dedicated to his achievements in a new museum set up within the stadium, he considers the next chapter of the storied old ground.